Alsterolle: Naming of a child born out of wedlock. One of the persons with swedish ancestors I have tried to help is +John beckstein. His ancestors are from the province of Dalsland in SW Sweden. My family lived in that area in the beginning of the 80's. 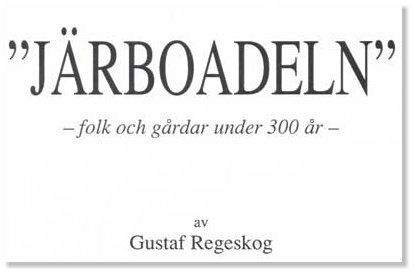 During his research John became aware of a book titled "Järboadeln" - The Järbo nobility. In this book there is an interesting discussion about the father of a child born out of wedlock. 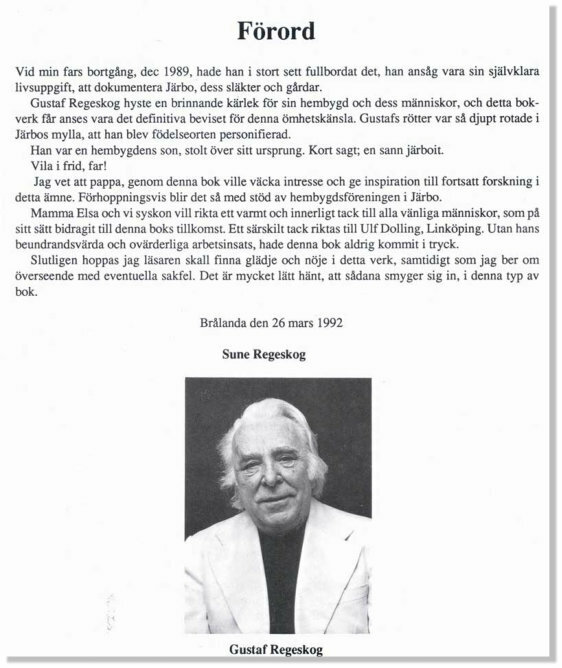 Note: I went to school in Vänersborg at the same time as Sune Regeskog, the son of the author. And Sune was our daughter Annika's teacher when we lived in Dals-Rostock. Since I made a translation from the original (with some corrections by John) I thought it would be nice to publish this discussion and give you an insight to swedish customs during the 19th century. Paulina Persdotter Svinhufvud born 1838 in Ödskölt, Dalsland province. Mother Britta Nilsdotter, born 1814. The original birthdocument. Steneby C:6 (1830-1859) Picture 21. From ArkivDigital. From left to right: Serial No; Birth and christening date; Mothers title and name; Her adress; WItnesses; Mothers age; Child's name. Comment. Besides the name Paulina it says "oägta" = Born out of wedlock. When a child was born out of wedlock in older times there was no law that the father´s name should be mentioned in the church book. Not even the mother was obliged to give his name. If the child was left to another caretaker or to a children´s home, it was not uncommon that no relative was noted; the child was totally anonymous. When the father´s name is not stated, it often is a married man or so called "person of rank". But honor said that you should provide support for the child as well as the mother. The worst case was when the father was without means. It is often said that in older times the master took advantage of their hired women. Judging from Järbo church books and tradition this was very unusual and for obvious reasons. The man´s wife, family, relatives etc. could not accept out-of-marriage activities. It took a toll on the economy and family honor. And it was against the sixth commandment. Extra-marital relations were accepted in the farm society, however before marriage you "slept on faith and promise". It was highly disgraceful for a man to abandon a girl who carried his child. If the man was married the situation for the mother was of course difficult. Before Christian times when polygamy was accepted, a woman who became pregnant by a married man automatically was a concubine - member of the family. The concubine children were entitled to inheritance just as the children to the first wife. So you can guess that the man thought about it twice before engaging in a love-affair. The woman also knows what could follow. For the children of this situation without a doubt were all treated equally. There were no so called "false" children born out of wedlock. Within Islam which rests on biblical foundation, the same family pattern exists. The classification into "true" and "false" children is linked to Christianity and thus the western cultural pattern. It can be noted that Christ never used the expression "false" children. The church and its representative members never thought a child born out of wedlock as a second class human. When the birth book said "oäkta"(out of wedlock) it means that the mother was not married. "Oäkta" just indicated the civil status and does not represent any moral basis of valuation. Around the years 1800 to 1900 about half of the women getting married were in "the family way" and the number was about the same in Järbo. This fact was never brought forward from the pulpit or in any protocols. When a woman expecting a child was abandoned by the father the shame was upon the man and not the woman. She was facing "Olycka" (bad luck) and most of these unlucky women were later married. They had been taught by experience that when a married man of means had a child with an unmarried woman, honor dictated that he should pay his way. One way was to "buy" another father to the child or in proper time, with the girls consent get her married to a bachelor keen on getting married, Of course with some amount of compensation, either a sum of money, a crofter's holding or a farm. From the few cases I know of, this was a bad solution in the long run. Jealousy and feelings of inferiority came into the picture. From the start a good and able farmhand could be developed into a real monster as husband. He was after all a bought husband. How W. Svinhufvud, Britta and her father, farmer Nils Olofsson on the neighbouring farm Brandserud, solved the love-affair are not known. The child, Paulina Persdotter, born 1838 in Ödskölt, indicates that the father was Per and from Ödskölt. The father is thus not indicated as "unknown", which was the standard procedure, when a "man of lineage" had a child with a "woman of the people". Ten years after the birth of Paulina, Britta married the soldier Petter Pettersson Häll, see Hult. Petter was the son of crofter Petter Olofsson at Djuret under Önne. He was born in 1794 in Ödskölt, married to Elin Persdotter born 1793, daughter to soldier Per Dalman, Råberg. It is possible that this Petter Olofsson from Ödskölt married to Elin Persdotter was involved getting a named father to Britta Nilsdotter's daughter Paulina. Petter was born 1824, ten years younger than Britta. There are no protocols, family chronicles or traditions, which indicates any controversies between the families. Paulina was fully aware that W. Svinhufvud was her father. Two of her own children had the same name as two of his children, Elisabeth and Fromholt. Probably there was "true love" between the captain at Önne and the farmer's daughter Britta. Britta's brother, parish clerk and organist Jonas Nilsson Branzell was a multitalented person and also said to be a handsome and warmhearted person. Probably Britta possessed the same qualities. Besides Wilhelm Svinhufvud, no other possessor of the captain’s residence was known for love affairs with the female servants or other females in the area. It is a fact that "Döbeln" had children with his housekeeper. But neither was married and the relationship lasted a lifetime and thus more similar to today’s common-law wife. From the beginning, the marriage was of no concern to the church. It was more of a juridical matter; a lifelong contact between the betroved couple and with the blessing of their respective parents. Paulina was a first name of almost noble character at this time. That the priest accepted the name at the christening indicates that he knew the name of the father of the child. It cannot be ruled out that W. Svinhufvud himself came up with suggestion for name to his daughter.